Jim Reeves lyrics are special, or maybe it's his beautiful voice that makes them special. 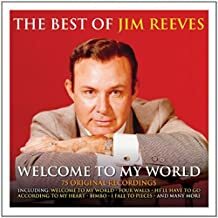 I don’t know of many artists that could deliver a song like Jim Reeves as his voice was so smooth and mellow. He is hard to duplicate when it comes to a beautiful love song such as "Am I Losing You". He has many great country classics that you will enjoy doing, just browse our Jim Reeves lyrics and chords , find some of your favorites and look for some you don’t know, it’s fun to learn new (old) songs. RCA signed Jim to a recording contract in 1956 that started his short but lustrous career. He recorded a brief eleven years until his death in a 1964 plane crash. His music was so loved that it continued to chart into the 1980’s with several top 10 posthumous hits. Jim earned sixteen gold, silver and platinum albums in the 1960’s. It’s not necessary to have a great voice or have great guitar skills to enjoy picking and singing. Most of us perform in the privacy of our homes so it doesn’t matter if we’re really good or really bad. I wasn’t blessed with vocal or picking skills, but that doesn’t stop me from enjoying it at home.